Cameroon President Paul Biya welcomed the engagement of U.S. troops in his country's fight against Boko Haram insurgents. But many Cameroonians do not yet understand the role of the troops in the war. President Biya in his end of the year message said Boko Haram had remained a major challenge to his country's development, peace and security, and saluted what he called the experience and expertise of American troops in helping Cameroon. He said he specially thanks the U.S. government and is highly delighted with the confidence of the American people, especially now that their troops have been providing vital information and training for his country's military. 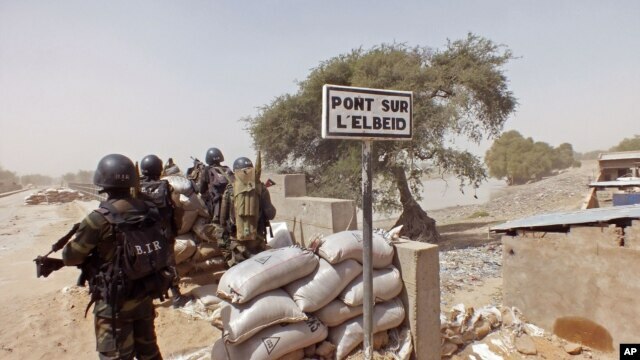 Thirty-year-old Muslim youth leader Bouba Ahijo said residents of Cameroon's northern town of Garoua were told U.S. troops had come to liberate them from Boko Haram atrocities. But he said he is still not aware what the Americans have been doing more than two months after they arrived. He expected the U.S. forces to fight alongside Cameroonian soldiers to defeat Boko Haram, but they have instead stayed in their offices since they came. He questions why the Americans have not attacked Boko Haram, as he hears they attacked an Islamic State base in Iraq. Cameroon has been fighting a Boko Haram insurgency that spilled over into its territory from Nigeria three years ago. According to the United Nations more than 20,000 people have lost their lives and more than two million people have been displaced. The head of the Marines contingent, Colonel Mike Davis, described the type of support the United States is giving the Cameroon army in the fight against Boko Haram. "Cameroon government asked the U.S. government to support them in the fight against Boko Haram, so what we are doing is assisting the Cameroonian government in the fight against Boko Haram. That support is in a way of remotely piloting aircraft among other things, training and some security stuff," said Davis. Cameroon Army General Ndjonkep Mehomy Frederick, one of the top commanders of Cameroon troops fighting the Boko Haram insurgency, said the assistance they are receiving from the Americans is basically training and intelligence sharing. He said the U.S. troops have excellent and up-to-date drones that give them vital and timely information, allowing them to then surgically intervene against the terrorists wherever an attack is taking place or is being planned. He said the Americans have been fully cooperating in surveillance and information sharing, which is very vital in the war against the terrorists. Cameroon military spokesman Colonel Didier Badjeck said people should not expect U.S. soldiers at the battle front, but that they are very instrumental in Cameroon's recent successes against the insurgents. He said American soldiers are in Cameroon exclusively to help eliminate Boko Haram with their advanced technology, and that from the month of February 2016, they will be fully operational when the rest of the remaining contingent arrives in Cameroon to make up the 300 promised by President Barack Obama. In December, Cameroon announced its soldiers and Nigeria's military had liberated more than 900 people from Boko Haram strongholds. Government officials said they benefited from the U.S. technical expertise. The U.S. military is setting up its first drone base in Africa and Cameroon believes it is likely to host it. Soldiers of the central African nation are learning how to use drones for surveillance from the U.S. Marines.